6 Pcs Mini Ceramic Succulent Plant Pots -- Ideal for outdoor container gardening or indoor Bonsai Pots, this mini style planter is a tough,lightweight alternative to ceramic planters.This planter offers fine all-weather durability. Filled with plants, flowers or Fake flowers, these favor pots make an fine gift. Mini in 6 Owl styles. Send your friend off with a small token of your appreciation. Bring fun to the display of your favorite succulents, indoor Bonsai Pots , mini style fake flowers , decorative objects with this lovely mini plant pots. MATERIAL:CERAMIC,transmutation glaze,A small Drain Hole on the Bottom,making it breathable,Perfect for holding succulent, herbs and catus plants. (Made of top-quality clay and baked in high temperatures). 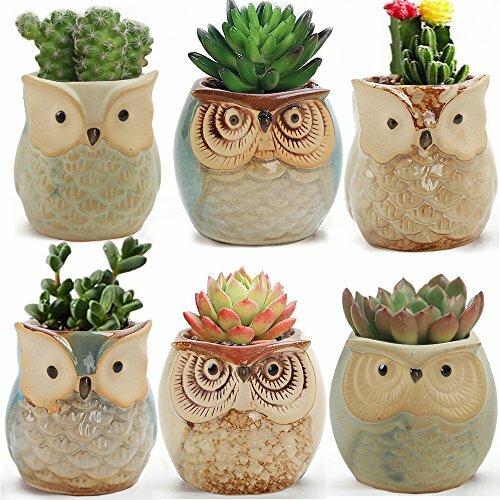 PACKAGE:1 set mini owl 6pcs*Pot,SIZE:2.4 x 2.64 inches(Diam x H);Plants are not included. CUTE DESIGN SUCCELENT PLANT POT,Ideal for adding a dash of refreshingly modern design to your home,Attractive owl pot is perfect to decorate your balcony,Windowsill,dinning table,Office desk and room,Adding fun to life. LUCKEGE MINI CERAMIC OWL PLANTERS look adorable. the sizes of these mini owl pots are ideal for festival gift for your friends,children, parents,Perfect Gift for Wedding, Birthday, Chrismas. 60 DAYS MONEY BACK GUARANTEE.We are responsible for quality problem, if you found any accidental damage or any problems, please contact us for help. If you have any questions about this product by LUCKEGO, contact us by completing and submitting the form below. If you are looking for a specif part number, please include it with your message.